So this happened on the weekend, got my first Maiden win, yay!! And we rode it with no fear or nerves at all! My treatment with Lindsay has given me my life back, since her sessions I haven’t looked back! Thank you so much Lindsay I couldn’t have done it without your help! You truly have a wonderful gift!!! I can honestly say I’ve never felt better! After my first session with Lindsay I had tools to cope with competition nerves – more confidence and relaxation. I have been able to step outside my comfort zone and achieve some personal best results. This included returning to Eventing at 1* level. Thank you so much, I am so much more positive in everything I have been doing. I hunted on Tuesday – Jumped three gorse hedges in a row, full wires etc with no worries or negative feelings, it was amazing. My lessons have been going fantastic with my young horse already working in a nice contact and I have a better understanding of what my trainer wants from us. I have really good news to report! Now that I’ve been out and competed I can definitely feel a big change in myself. I enjoyed it and my horse was really relaxed and tried really hard. I felt like I was smiling inside – so cool. I’m so thrilled with everything and have noticed I’m sleeping more soundly too. So a really big thank you for your help. Just a quick email to let you know I am making real progress with my riding confidence and enjoyment. After some initial problems with the DVD drive in my computer I have been able to listen to the CDs. I am now able to sit up and ride forward when my horse wants to stop and pay attention to things happening outside the arena. This happened from the first ride which is great. A couple of times he has gone to do his surge forward which would have previously resulted in me going forward onto his neck, instead I was able to sit up and keep my position. Today I got straight on without any need to lunge. Thanks for your help, it has been even better than I hoped for. Before I worked with Lindsay I had incredible anxiety, but now I’m doing very well. Her sessions were so beneficial and worked fabulously! I have suffered three bouts of severe psychosomatic pain in my left leg in the last 2 years. They can last for months and I never knew when the pain would start or stop. My doctor prescribed pain killers and these and physiotherapy had a detrimental effect. After 2 months in the third attack I saw Lindsay. In 3 sessions she cured me. Since then I listen to the recorded hypnotherapy session daily and I believe that I should not get a recurrence while I continue to self hypnotise. Thank you so much Lindsay for giving me my life back. After a recent and unexpected marital separation I went through a prolonged period of sleeplessness, depression and experienced a lack of self-esteem. I was referred to Lindsay and after several sessions I was able to overcome these issues and get my life back on track. It is with no doubt that her expertise in these matters helped my recovery. Hi Lindsay, You hypnotised me over at Silver Linings a couple of months ago. Just thought I’d let you know how it’s been going. I have been playing the CDs each night so that’s all good- having a nice moment of relaxation as well is lovely. However, the most brilliant thing is that I competed Norman for the first time on Sunday. He was an absolute ANGEL. He neighed out in the warm up ring a fair bit but we got through and when we rode our tests he was quiet, focused and concentrating – it was sooooo fabulous. He tried so hard. I rode both tests with a huge grin on my face. It’s been nearly 5 years since I could do this. Imagine how overjoyed I was when we got two thirds and some lovely comments from the judges about what a calm horse he was and what a happy combination we were. I am rapt……. Thank you so much. You have really made a difference. I am on Cloud 9. I never thought I’d ever manage to get on him at an event let alone inside an arena. BRILLIANT STUFF. Hope the UK isn’t too freezing. Thank you once again and again. Dear Lindsay, Finally I am here to tell you my story of success after our sessions I had when you were here last in Bowral Australia, April 2010. For my 60th birthday we found my dream horse in Germany. Don Defacto … known as Donni. Through very close friends who own the Max-Hof Equestrian centre just outside Munich they heard of a horse that was in a yard just outside the area and he appeared to be just the horse for me. We just happened to be on an overseas trip travelling through Spain and calling into Germany to catch up with our friends when we went to see Donni and fell in love with him. So off to Australia he came. Working at Novice/Elementary, we are now working at Medium level, training with Sue Hearn and Larissa Chadwick my mentors. My goal was to compete in the Joan Springett arena and get 60% + at Medium level. After our sessions my anxiety attacks and competition nerves left me and I was able to focus on the tests and achieved my goal. I eventually want to achieve Prix.St.George next year so I look forward to your next visit to have another tune up. “The most powerful tool we have is our minds and how we complicate things with it” – so now having the tools to clear one’s thoughts to the positives is a great journey in one’s life for everything we do. Have now got my confidence up even more jumping and got up to my target height of 80cm in practice the other day!! The main point is that I remembered my test fine, wasn’t as nervous (so you have helped!!!) and so Debz wasn’t and we did a reasonable test..got 2nd place in dressage which of course sets you up for the SJ and XC. We flew around for a clear SJ and XC so came 2nd overall!!! Yeeha. So now going to concentrate on bigger XC jumps as my next target. Thanks again for all your help…..the “calm”ing influence is definitely helping! Hi Lindsay, just a quick email to say “Hi” and to let you know how we are progressing. Have been riding both of my horses – with no nerves at all!!! Not even a tiny little bit!!! Also, little mishaps in the paddock don’t get me anxious or stressed out like they used to! Both horses are great – we are progressing really well and once I finish work for the Christmas break I’ll have heaps of time to spend with them and do lots of riding. Still listening to the CDs (nearly) every night and very happy with the progress to date! I also went double clear cross country and double clear show jumping. I’m competing this weekend in the Flat & Musical state champs so I hope I can feel as good as I did last time. You will be pleased to hear I received my CD in the mail successfully :). Here are some photos of Jerry and I at a recent comp, and some of my team who will be competing this weekend. Just a quick note to say it was awesome to meet you and have the “experience”. Hope your flights back went well! Nigel and I are really keen to get stuck in and see what changes we experience. We understand it is up to us now to put in the effort – there is no quick fixes for ingrained and long established patterns of behaviour I know! I feel much more positive about competing already so that is a marvellous start. I hope you enjoyed your brief time with us and we can show you some sights etc next time! Some feedback – I am feeling great! Judged 2 full dressage classes yesterday with full concentration – unheard of!! I usually can only do one – am enjoying the CD – fantastic! Had a great lesson on Friday – no nerves – and have got my partner interested in doing the CD. Anyway – really looking forward to receiving the ‘real thing’ CD & getting to work! Jenny has also listened to her CD every day & is loving it! Thanks so much for your time – I really enjoyed it & look forward to seeing you again. Hi Lindsay, just wanted to let you know that the non-smoking is going really well. I haven’t even had the urge to smoke. Thank you very much for that. I have spent plenty of time with smokers lately too. I don’t get the slightest urge to join in with them either, which is great! Saw a friend at a jumping fun day locally and he is feeling really good about his jumping and stuff too. Thanks again and if I get the slightest urge I will be back in touch. I certainly don’t want to go down that path again. Thanks Lindsay, I will certainly pass your flyers on with full recommendation. Kim has certainly benefited from your help. Her and Bonnie managed a first in the Young Rider at Levin, a great thrill. Look forward to catching up at HOY. Just a quick note to say thanks, we’re getting better and more confident each time we go out. My Elish is below, looking very pleased with herself after the Ashburton A & P Show, and the Show Hunter day over the weekend. Just wanted you to know that it worked! I jumped Danny for the first time today since I had my sessions with you (entirely due to the weather that it’s taken this long!) and we had a fabulous time. I was so calm and relaxed it was truly amazing. I thoroughly, thoroughly enjoyed myself and consequently, so did he. Now I see why people who enjoy jumping can’t get enough of it! We’ve got a show jumping competition this Saturday so we’ll see if I can carry it through that additional pressure but I’ve got no reason to think I can’t. I first met Lindsay at the Horse of the year 08 in a marquee I was visiting. They were selling rescue remedy and Lindsay said to the stallholder if they knew of anyone this did not work for, to send them to her. I heard this and told her it didn’t work for me. We arranged a session of Hypnotherapy and it has been the best money I have ever spent. I was too scared to jump 50cm let alone anything bigger after a bad accident. Now my horse and I are jumping 70-75cm without blinking an eye. I listened to the CDs Lindsay sent me and entered several events in the area. 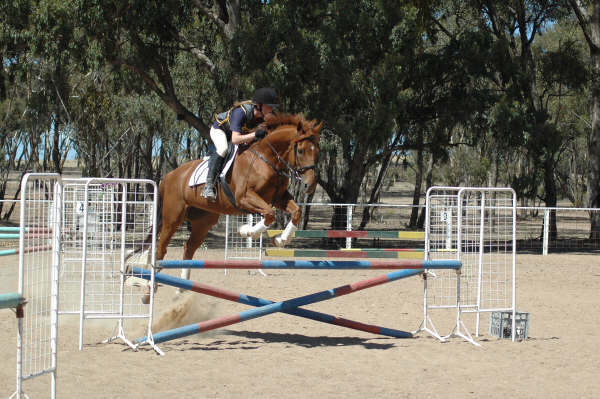 I started off with the smaller jumps and worked my way up to the 70cm range. I am now confident when I go out and if I feel a bit scared about an event, I listen to my CDs and everything is good. Everyone who knew me this time last year cannot believe the difference in me, or my horse, because I am more confident my horse is too. We went to the Wanstead one day event just after I had my sessions with Lindsay, we still didn’t do too well in the show jumping, but we flew around the cross country and there were only approximately 6 that went clear and I was one of them. Every event after that cross-country was our thing, we still had problems with show jumping though, and we just couldn’t seem to get it together. On the 17th August my horse and I went to the show jumping training day at Equestrian Park. I listened to my CDs every day the week before to prepare. Well we flew around the course and got a double clear in the 70cm class. I was so happy I cried, as this was our first success at show jumping. Yesterday Sunday the 31st August was the pony club Top score event. I listened to my CD the Wednesday and the Saturday before the event. I entered the Top score class, jigsaw class and the triple 6 events at 65cm. I got 4th in the Top score and jumped the Joker jump twice, 2nd in the jigsaw event which is 2 horses jumping in the ring together and it is timed, and 6th in the triple 6 event, which is 6 cross country jumps, 6 show jumps and 6 obstacles. My horse didn’t even look like he was going to stop at the jumps. These have been the first very successful days for me. They may only be small jumps to some people but they are a big success to me. Also in my own wellbeing I am a lot happier and calmer in my mind and more confident in work and personal life. If I feel stress coming on I think of Lindsay’s words and relax and everything is o.k. I don’t think I would be this far without Lindsay and her calming words and voice. Thank you Lindsay for everything you have done for me and I will keep you posted on my future successes. I just wanted to say a big thank you for all the help you gave me to compete my horse at HOY. It was a great to have the relaxed feeling like I used to have when I was competing my mare many moons ago. Yes the CD is helping. I had a lesson with Jayne on Friday. I was a little nervous in the beginning, but relaxed and actually had a really good ride. 🙂 Thanks a lot for your help. Thank you so much for the catch up and the time spent with you, you are amazing!! The relaxation exercises are going just fantastic. I have been listening to the disk once, twice or more a day depending on how I feel, and it has certainly made me more aware of situations where I am not relaxed, it triggers your relaxation words on the disk. I always thought I was a pretty cool calm collected person, however my brains often revert to your words a lot during the day during certain situations and I take 3 deep breaths.